MediaFiler is the easiest asset acquisition software in the industry. Your traffic system or our dublist processor can be used to create a drop-down list of “to be dubbed” material. ShowTimer, PathFire and/or FlipFactory interfaces add a “need to review” list in the MediaFiler drop-down list. The operator simply selects the house-name and up to three simultaneous destinations (1 primary and 2 backup source) then MediaFiler populates all known metadata automatically. This minimizes data entry errors and can eliminate the printed “check-off sheet”. Source control can be accomplished directly from the software with simple keyboard and mouse clicks or through an optional hands-on Shuttle-Jog Controller. Use house Traffic system to populate a drop-down dub “to-do” list. Interfaces with ShowTimer, PathFire, and FlipFactory to populate “to-do” list for must-review-before-air material. Ingest into a primary and up to two backup locations. VTR source may be controlled from the Media Filer interface or through an optional Shuttle Jog Controller (“hands-on” control panel similar to a Sony or Panasonic VTR Shuttle-Jog control panel). Ingest in 3 steps: Record, Review & Accept. Efficiently ingest from video tape machines or video servers. Transfer into 1, 2, or 3 storage devices at the same time. Access Traffic Dub List information with an integrated media database to reduce data entry. Easily enter & review metadata including House Name, Media Name, Advertiser Name, Product, Agency ID, Expiration Date, & Federal Code. Automatically store metadata in the central Florical media database. Optionally record source material & trim the results on the target video server. Review and Approve: Automatically review recorded material on any target storage device for accuracy. Simultaneously record & review material on the target. Easily reject & rerun transfers for perfect material. Share resources: Reduce equipment costs by sharing machine control resources with other Florical automation products. Share the same source & target machines between multiple MediaFiler workstations. Support virtually all VDCP protocol video servers & Sony protocol VTRs. Access separate databases used in ShareCasting & multi-channel operations. 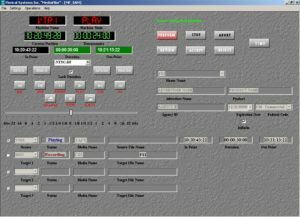 Control: control all source & record machines from one console. Control shuttle/jog, fast forward, rewind, stop, jog one frame & go to beginning/end of file. Use the optional multimedia controller with jog/shuttle knob & buttons for improved productivity & enhanced control. Get machine status & current position feedback. Automatically connect source & target machines with optional source router control. Automatically switch the video monitor source with the optional monitor router control. Improve Quality: Get frame accurate transfers automatically. Easily mark in-mark outsource or target material with frame-by-frame review. Start high & low resolution encodes within the same TV frame for accurate time code in the original & proxy material. System: Dell / Intel Core 2 computer with Microsoft Windows Windows XP Pro-SP3, 3.0GHz CPU, 2 GB RAM, 160GB HD X2, RAID1. Additional VTR: Control an additional video tape machine as a source. Additional Video Server Port: Control an additional video server encoder port for ingest & decoder port for review. Shared Machine Control: Support shared machine control with a Florical device server for one or more MediaFiler devices. Ingest Source Router Control: Control a single router output to automatically connect a source to the target (add one for each target). Multimedia Shuttle/Jog Controller: Add an external controller with jog/shuttle knob & buttons for improved productivity & enhanced control. Edit & encode tag placement on promotions with the Inscriber Namedropper XL, including split audio/video mark in points. Video servers controlled using VDCP protocol via RS-422 unless otherwise noted. Video Tape Recorders: VTRs controlled using Sony BVW protocol via RS-422.